Checkpoints showcases new work by writers from all over the world examining the literal and metaphorical barriers that scar the globe. With Ian McEwan, Xiaolu Guo, Jeffrey Eugenides, Aleksandar Hemon, and many more. 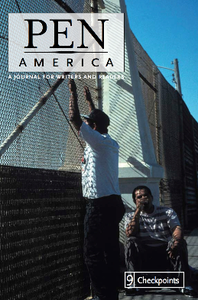 Writing from this issue has been included in Best American Essays and the Pushcart Prize anthology.